Are you one of the 80% of people suffering from neck or back pain? If so, then you’ve probably been told to “strengthen your core”. Most people equate this statement to going home and doing crunches, but we would like to offer you an entirely different opinion: doing crunches is the LAST exercise you should be doing if you’re struggling with a weak core and back/neck pain. Here is why: almost every client walking into my studio these days has what I call “hunchback posture” (AKA kyphosis). This is a direct result of modern trends in society today, where we constantly look down at our phones, hunch to stare at our computers, and drive back and forth to work, fatigued, as we fight traffic. This hunchback position places a large amount of strain on the neck and shoulder joints. Think of your upper spine as a set of Legos. If your 10 pound head is sitting on the top of the lego tower, it has a chance of staying put. But if you move that bowling ball just a few inches forward… CRASH. It all comes tumbling down and the stability of the tower is compromised. If you’re embarking on an exercise and stretch routine to get stronger and reduce pain, your goal should be to fix this postural deviation, and get back to standing straight. Let’s stop the insanity that personal trainers, Pilates instructors and boot camp instructors have mistakenly glorified: let’s be rebels and stop doing crunches. And now that I’ve gotten that off my chest, let’s talk about what you should be doing and why you should be doing it EVERYDAY to relieve yourself of your achy and creaky back. The “core” can be defined in numerous ways, but to give you an idea of how complex the human body is, there are more than 20 muscles in the midsection between the pelvis and ribcage. The muscles that most experts would agree make up the core include the rectus abdominis (the “6-pack muscle”), the transversus abdominis (“pull in your bellybutton” muscle), and the internal and external obliques (the muscles under your love handles). The rectus abdominis is the muscle on the top, the one that looks like a 6 pack when you are lean and fit. This muscle is the primary mover when doing “crunches”; it flexes the lumbar (lower) spine. Here’s the problem though: a lot of people are actually tight in this muscle since they flex and hunch all day long. What they need more is to stretch this particular muscle and help get it back to optimal length. Sure, working it is important to build strength in the midsection, but not unless you are counteracting this movement with an equal and opposite movement such as back extension. Do you think your weekend certified bootcamp instructor is thinking about this? Probably not… (though, sometimes I am surprised). What muscles are best to emphasize when strengthening your core? 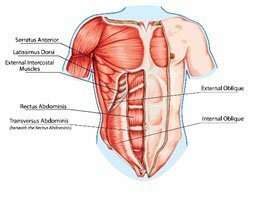 The transversus abdominis is a muscle that wraps around your spine and lies underneath the rectus abdominis. It aids in supporting and stabilizing the pelvis and spine. It’s one of the most important muscles to strengthen when attempting to build core musculature. The internal and external obliques are also important, not only in flexion (example: rotating bicycle crunches) but also in lateral flexion. This is when you bend to the side, shortening the distance from your shoulder to your hip. There are also some important muscles in your back, the latissimus dorsi and lower trapezius being my favorite. When working optimally, these muscles will help keep your shoulder girdle in a better position and reduce strain on the neck and shoulders. Ever heard an instructor tell you to “pull your shoulders down”? They are yelling at these back muscles (and your serratus anterior) to wake up. But wait!! I also want a flat belly? Don’t I need to do crunches for this? Long answer: we are not capable of “spot reducing” areas of our body through targeted exercises. Belly fat comes from too much sugar consumption, overall diet and calories consumption and lack of physical exertion. Genetics also plays a part: some people just lose fat in their midsection at the very end. When you reduce the overall fat percentage in your body, you can make muscles look more defined by doing exercises to develop them, but you cannot get a flat belly by just doing a ton of crunches. If you plan to be a fitness model, then I won’t argue with you, you will need to do rectus abdominis work to get your “6 pack” definition. But beyond that, you can get a flat stomach by eating right, burning more calories than you consume, and building muscles mass throughout the whole body. A strong, properly aligned body will keep you injury free so you can accomplish all this. What exercises can you do to strengthen your core? 1. The Plank: Most people on the planet have heard of the plank, tried doing a plank, dreaded the plank, and screaming & running away from the plank. You are now part of a special club that will learn to LOVE the plank, since we’ll demonstrate how to do it correctly. The biggest mistake people make when doing a plank is to “round the upper spine”. What good were the last 1114 words you just read explaining you NOT to round the upper spine, if you continue making this mistake? Check out the guy on the photo below. His mid back is so rounded it actually hurts me to look at. To make it worse he is looking forward which means he extending his neck more than he should. Start with your hands or elbows under your shoulders and make sure your eyes are looking directly in front of your hands. If you are on your elbows be sure to go palms face UP. Why? Because this promotes external rotation of the shoulder joint which helps to reduce the likelihood that you will round your upper spine. From this position, begin by pulling your navel into your spine and slightly squeezing your glutes. Don’t TUCK your pelvis under (which means do NOT move your pelvis so that you eliminate the arch in your lower back). I just want you to engage these muscles before you begin so you don’t fall into an excessive back arch. Now lift your knees off the ground so you create a straight line from the top of your head to your heels. The biggest mistake here is that people raise their hips up higher or let them sink lower. Think straight line. What do you do if it’s just too hard? MODIFY! In this case the modification is dropping to the knees. Now you can create a straight line from your head to your knees. Start here, and work yourself up to 1 minute on the knees before moving to the toes. 2. 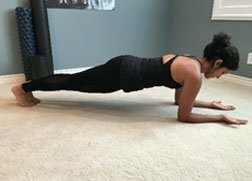 Side Plank: why do I love the side plank so much? Because it’s a wonderful oblique stability exercise and it helps strengthen those important back muscles. For this one you also start with the elbow below the shoulder on one side. This is super important. If the elbow is too high you will use too many neck muscles and won’t be able to access your back. Look down, and place your elbow correctly. Now look forward at the wall ahead of you. Where you look is where your head naturally goes so if you’re looking down, guess what happens? You got it, your cervical spine will look down and round your upper back. So look straight ahead. The harder way to do this is to stack your legs on top of each other and push yourself up into you side plank position. Another way is to place the top leg in front of the bottom leg and push yourself up. Either way, make sure your hips are stacked on top of each other. If someone was looking at you from the top, they should be able to see only one hip/leg. Another important note here is that you need to feel like you are pulling your bottom elbow in towards your waist as much as possible. In a large class, you’ll often hear to pull the mat towards your hip as if you wanted to crinkle the mat. Do not let the shoulder graze up by the ears. To modify on this exercise, simply drop the bottom knee. The bottom half of that bottom leg should be bent and sticking straight back behind you. From there you can support yourself more and concentrate on all the other amazing changes you are making with this exercise. Your goal here is to get up to 1 minute of holding a side plank on each side. 3. Basic Back Extension: Last, but certainly not least, let’s work on your back muscles. Yes these are part of your core. This exercise works the lats, opens up the rounding of your shoulders, makes you look taller and can help combat neck pain. Start lying face down with your forehead on the mat. Your legs can be hip-width distance apart and they stay planted on the floor for this version of the exercise. Have your hands by the sides of your body with the palms facing the body. If you want more challenge, turn the palms face down on the floor to promote more of that shoulder external rotation. 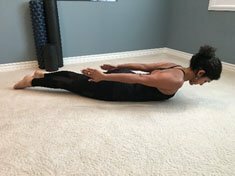 Before you begin, pull your navel into your spine gently without tucking (just like in the plank) and squeeze your glutes and hamstrings (just like in the plank). Lift your head, neck and shoulders off the floor. Reach your fingers towards your toes while keeping your eyes looking down at the floor. Do not look ahead as it can strain your neck (don’t be like our man in blue). Lower yourself back down to the ground and tap your nose on the floor. Don’t take a vacation down there, repeat the exercise again and lift yourself right back. Do this exercise between 10 and 15 times slowly and with control. So, what’s the takeaway from all this? Crunches are an antiquated way to truly strengthen the back and lengthen the spine. Many fitness professionals still use them and make their clients believe that they will be flattening their midsection. 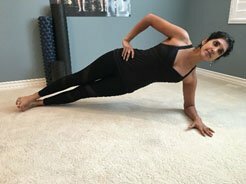 But now you’ve seen the light: crunches alone cannot help flatten your tummy – having a super strong inner core can help you lead a healthier, pain free life. So don’t hunch, don’t crunch and strengthen your core from the inside. 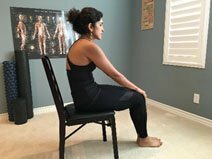 Author: Zeena Dhalla is a Certified Posture Specialist and self-proclaimed posture GEEK. She helps people eliminate neck and back pain through simple and effective home-based exercise routines. Download the 5 Minute Solution to Hunchback Posture if you want to improve your posture and get out of bed every morning with less pain and more pizazz.